Plant breeding with farmers — A technical manual, S. Ceccarelli, ICARDA, Aleppo, Syria, 2012. 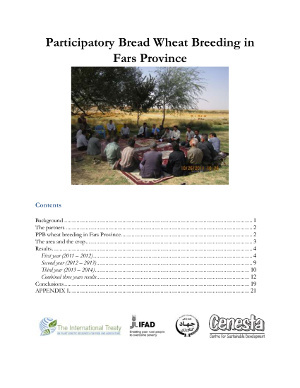 This manual on Participatory Plant Breeding (PPB) is based primarily on the direct experience derived from several years of implementing PPB programmes in a number of countries and on a number of crops, and secondly, from a number of training courses (China, Ethiopia, Jordan, Australia, South Africa) and when necessary, on relevant scientific literature, as part of the ICARDA research programme. The methods presented here have been used by in rural communities over the course of several years particularly in North Africa (Tunisia, Morocco, Egypt and Algeria), the Horn of Africa (Eritrea and Ethiopia), the Arabian Peninsula (Yemen), the Near East (Syria, Jordan and Iran) and by others (NGOs, Universities, IARCs, etc.) in other countries. Most probably the methods described will not suit every situation that researchers and partners are likely to encounter; therefore, the manual will attempt to give some general principles that may help in adjusting the methodologies to new situations.